If there’s one thing I have learned in my time creating video at Granger it’s that I can shoot the most amazing footage and have the coolest motion graphics—but if I have bad audio I have a bad product. Once upon a time there was a story of life change that, if captured and told, could change lives. So we contacted our video guy, also known as Joe Shmoe (also known as Dustin Maust). He shows up with a camera, shoots the story, and it looks beautiful. He captures tears, laughter, and has the best comedic movement ever. This video will be awe inspiring. He sits down to edit this masterpiece only to realize all he can hear is the hum of the air conditioner and the loud kids in the room next door with a hint of his subject underneath. He leans back in his chair, raises his hands to the sky and cries out, “Why, oh why did I not heed the words of my master Adam Tarwacki? !” *Just so we are clear, I actually learned this from Dustin but I’m sure he learned if from somewhere else. 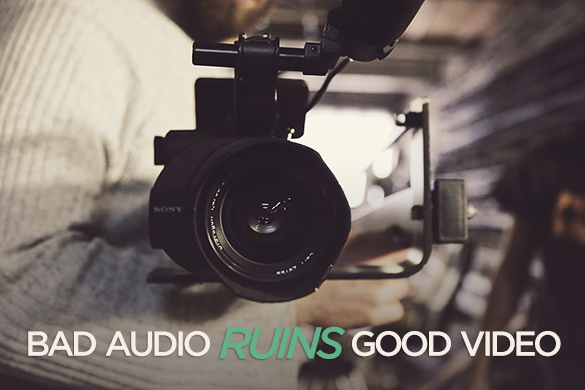 It all boils down to this: Good audio is half of a good video. You cannot forget about audio. Your audience will become distracted with humming and hissing and peaking volume. It’s hard to concentrate on the real story. Our job is to provide a full product that is engaging, beautiful, and helpful—one that tells the story and is distraction-free so the message is clear.